April 15, 2012 marks the 100th anniversary of the sinking of the RMS Titanic. After departing on her maiden voyage from Southampton, England on April 10, 1912, she struck an iceberg in the Atlantic Ocean off of Newfoundland on the night of April 14. The ship sunk a couple of hours later on April 15. Over 1,500 people perished in the sinking. 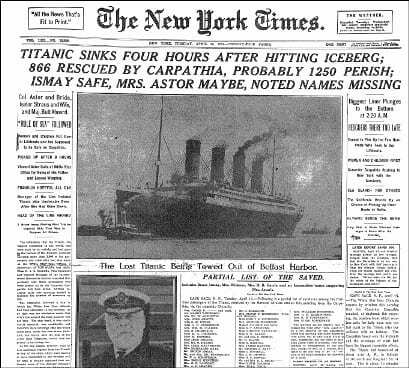 You can follow news reports and first-hand accounts of the Titanic by searching Cofrin Library’s Historical New York Times (Proquest) database. It provides full coverage of the New York Times from the 1850s to the 2000s. When searching for a historical event, go to the “Advanced Search” link on the database homepage, type in the keywords to the event you are looking for, and select the appropriate date range. If you need help, Ask-a-Librarian.